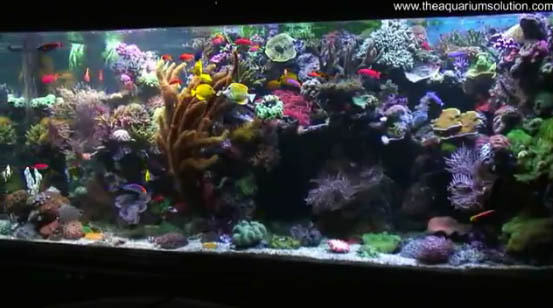 A few weeks ago we featured a video of David Saxby’s Reef Aquarium. We just came across a High Definition video from may of 09 showing the current state of the tank. This amazing reef tank was stripped down in August of 08 and then put back together with more emphasis on SPS and many smaller fish. If you are unfamiliar with David’s tank, it is considered as one of the nicer privately owned reef tanks around. The diversity and health of the livestock is simply inspiring. This large reef tank is stocked with variety of wrasses, anthias, bangai cardinals, yellow tangs, purple tangs, several other large tangs, and so much more. If you love reef aquariums, these will be nine minutes and fifty two seconds well worth spending.